Boston (especially Back Bay) is the perfect shopping destination! Within a few block radius, you can find stylish clothing, amazing shoes, boots and accessories of every type from glamorous jewelry to exotic scarves! We begin our adventure on Newbury Street across from the Public Garden at Arlington Street. All of the cross streets in Back Bay run alphabetically A-H, so figuring out the perfect shopping locale is a breeze! Start your day between Berkeley & Clarendon Streets to visit the gorgeous Restoration Hardware located in the newly restored former Museum of Natural History. Exit out onto Boylston Street before turning back up Clarendon to return to Newbury Street. Newbury Street is home to world class boutiques and Boston favorites. In the first two blocks you can shop for a new “T” bracelet at Tiffany’s or a personalized scarf at Burberry – did you know you may choose polka dots for the first time ever? – or a custom men’s suit at Boston’s renowned Brooks Brothers. If you need a little snack to fuel your adventure, Georgetown Cupcakes is directly across the street – you can’t miss the line! Meandering down Newbury to Dartmouth & Exeter Streets will bring you past the Simon Pearce Glass Studio to a lively patio or fireplace lunch scene at Stephanie’s On Newbury. Rub shoulders with celebs as you indulge in their signature cocktails, delicious salads, or decadent mac n cheese. After a scrumptious lunch, swing up to Commonwealth Avenue for a quick stroll along the tree-lined boulevard. 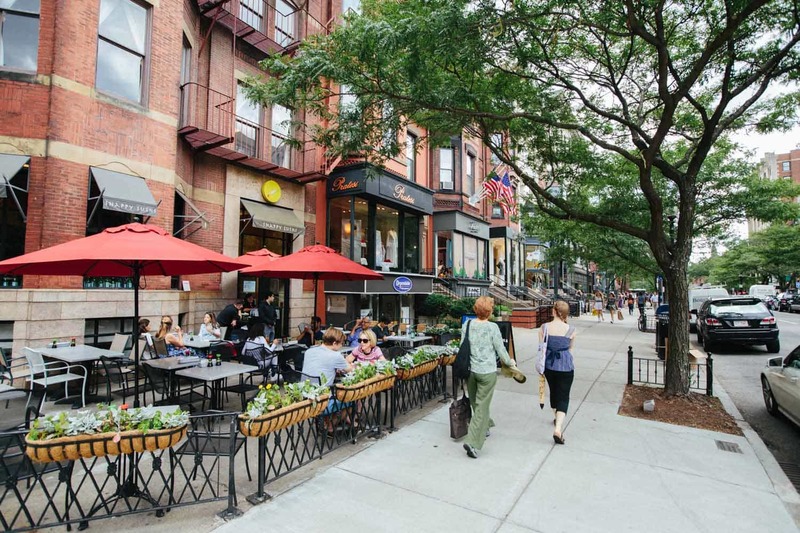 Continue back to Newbury Street and make a right to find more shopping, especially small local spots and additional great dining like Sonsie, with their beautiful open frontage, as well as world class spas, such as G2O Spa, and hair salons, such as Persona. Who doesn’t love a new look to go with the latest fashion finds? On your way back, stroll down to Boylston Street and pop into Saks to find a fab Chanel lipstick. The best part of your shopping adventure on Newbury? Where ever you go, you’re only moments from your comfortable Lenox room on Exeter. We can’t wait to welcome you back with a coffee or a cocktail and all of your treasures! The Lenox Hotel, time well spent – A Newbury Adventure, a day well spent!